Patricia B.J. et al., 2003 – Isolation, characterisation of SVMP inhibitor. Patricia et al. Investigated the PO41 as a SVMP inhibitor which was isolated from Philander opossum serum. The study was carried out using proper grade chemicals, the wistar rats were used as the test animal. For the isolation of the PO41 a DEAE-sephacel column (1.0 x 10.5) was used. 10mM sodium acetate (pH 3.7, flow rate 0.16ml/min) was used for column equilibriation. Isocratic elution with same buffer was done following the linear NaCl gradient. ABF-Po was pooled and further processed to get desired product. For the characterisation of it the polyacylamide gel electrophoresis, isoelecric focusing, amino acid analysis and molecular mass determination was done. The results of serum fractionation of P. opossum on a DEAE-Sephacel column, showed two peaks. ABF-Po eluted on the second peak (0.25M NaCl). The ABF-Po here obtained was futher chromatographed on Phenyl-Superose which gave five peaks. Authors mentioned that peak V showed antihaemorrhagic activity. Reducing SDS PAGE carried out in this study showed the following results. Authors used the method developed by Kondo et al.1960 for estimating the haemorrhagic activity of B. jararaca venom and jararhagin. One minimum haemorrhagic dose (MHD) was injected intradermally into the shaved back skin. Inhibition was tested by simultaneous injection of Bjv / jararhagin with PO41. A one-fold molar excess of PO41 subunit was used. measurement of Haemorrhagic spots was done after 24 h.
The ability of PO41 to inhibit the fibrinogenolytic activity of SVMP was shown by doing the reducing SDS-PAGE. The PO41 and SVMPs were used in 1:1 molar ratio. The authors said when the 15µg of jararhagin was injected along with PO41 subunit, no haemorrhagic activity can be seen. These results proves that PO41 is a potent SVMP inhibitor. It is very capable of neutralizing the haemorragic effect of metalloproteases isolated from B. Jararaca venom. Its further use as as drug can undertaken for broad action against other variable SVMPs. Metalloprotease are enzymes which split peptide bonds in proteins and are involved in many biological and pathological processes. These metalloproteases are in a delicate balance with protease inhibitors to control biological functions. 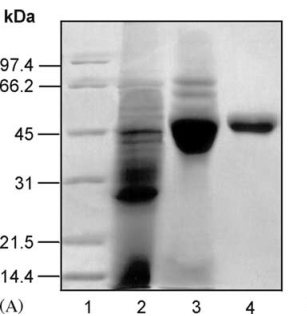 Matrix metalloproteases (MMPs) or matrixins are a family of zinc endopeptidases that function in the degradation of extracellular matrix proteins and play a key role in tissue degradation during embryogenesis, tissue growth, and wound healing in mammals. (28) They also belong to the metalloproteinase class which is one of the four major classes of proteases (serine, cysteine, aspartyl. And metalloproteases). Local tissue damage induced by viperid snake venoms are caused predominantly by the action of hemorrhagic zink depedent metalloproteases (SVMP). Romero F.V. et al. (2012) have identified a snake venom metalloprotease inhibitor targeted against the Bothrops asper metalloproteinase P1(BaP1). First they screened the Prestwick Chemical Library (PCL). It was consisting of 880 off-patent small molecules of known pharmacology. They selected 16 compounds for their dose and found out their responses. Following active compounds were identified after triplicate assay. 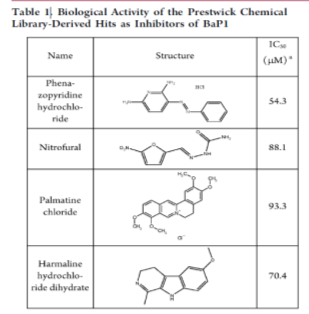 Biological activity of the PCL-derived hits as Inhibitors of BaP1. But these compound were not containing any ZBG (Zinc binding group) and the future improvements of it could be questioned. These results lead the authors to think of new ways for BaP1 inhibition. After this the authors focused their attention towards the production of Bap1 peptide with a ZBG present at the carboxy terminus. The authors collected information after the compound screening. According to information they decided that their design should have amphipathic nitrogen-heterocyclic side chain amino acids (His, Trp−Arg was also included as an amphiphatic side chain) or aromatic side chains (Phe,Tyr) . At position P2′ (contact site to the S2′pocket), Leu, was selected. Then authors went for solid phase synthesis of the peptide, either by coupling or not to hydroxamate. The N-Fmoc chemistry was used for this synthesis. FLP and FLP sequence were found very effective. the authors studied the interaction between enzymes active site and tripeptides using computer simulated docking. Different binding modes were seen. These two effective inhibitor tripeptides were further studied for Zn2+ binding. The binding was studied by a competitive Zn2+ binding assay based in 2-(4-benzylpiperazin-1-yl)-N-[(2-hydroxy-3-prop-2-enyl-phenyl)-methylideneamino]acetamide (PAC-1). PAC-1 is a strong affinity Zn2+ compound. According to the authors the results of both the assays suggested that the two peptides have specificity for BaP1. Computer simulated docking of Phe-Leu-Phe-NHOH to BaP1 showed that the tripeptide interacts with the active site. In the active site, it specifically bind to Zn2+ ion. From this work it can be concluded that the production of synthetic peptides targated against the ZBG of mettaloproteases offer promising future as potential drug candidates. Jurgilas, B. et al., 2003. PO41 , a snake venom metalloproteinase inhibitor isolated from Philander opossum serum. , 42, pp.621–628. "SVMP Inhibitor Isolation and Characterisation." UKEssays.com. 11 2018. All Answers Ltd. 04 2019 <https://www.ukessays.com/essays/biology/isolation-characterisation-svmp-9320.php?vref=1>. "SVMP Inhibitor Isolation and Characterisation." All Answers Ltd. ukessays.com, November 2018. Web. 26 April 2019. <https://www.ukessays.com/essays/biology/isolation-characterisation-svmp-9320.php?vref=1>. UKEssays. November 2018. SVMP Inhibitor Isolation and Characterisation. [online]. Available from: https://www.ukessays.com/essays/biology/isolation-characterisation-svmp-9320.php?vref=1 [Accessed 26 April 2019]. UKEssays. SVMP Inhibitor Isolation and Characterisation [Internet]. November 2018. [Accessed 26 April 2019]; Available from: https://www.ukessays.com/essays/biology/isolation-characterisation-svmp-9320.php?vref=1.